It’s been an up-and-down year for the Washington Capitals, who now find themselves 3 points behind 8th place in the East and 2 points behind division leader Winnipeg. McPhee was entrusted with the task of determining whether the team was closer to making a strong playoff push, or fading fast from the running. The latter would have offered the opportunity for the GM to make manageable roster moves that would likely have netted a nice crop of draft picks and prospects to restock the organization’s farm team. Instead, McPhee opted to pursue the former, potentially mortgaging the future in the process. Forsberg, the team’s 1st draft pick in last June’s NHL Entry draft, was the top rated European prospect in the draft. He was expected to be taken in the first three picks, but the defense-heavy draft allowed Forsberg to fall to the Capitals with the 11th overall pick. After a very positive showing at Caps training camp, the 18 year-old returned to Leksand, his team in native Sweden, where he recorded 33 points in 38 games so far. He was expected to report to AHL Hershey when his season ended in Sweden. The 31 year-old Martin Erat was a 7th round draft pick in the 1999 class, making his NHL debut in 2001 with the Nashville Predators. While being decently productive throughout his career, it remains to be seen if he can become an elite scorer. Classified as a lower-echelon 2nd line Forward, Erat has eclipsed the 50-pt plateau only 5 times throughout his 11 year career. He will presumably join a second line that will include Brooks Laich and Mike Ribeiro, a name that was linked throughout the last few weeks to numerous trade rumors. From a close in perspective, this trade appears to be an attempt for the Capitals to keep pace with powerhouses Pittsburgh and Boston. Pittsburgh acquired a multitude of players prior to today’s trade deadline, headlined by long-time Calgary Flames captain Jarome Iginla. Boston, meanwhile, made a bold move of their own, acquiring the services of ex-Capital and Penguin Jaromir Jagr. Despite the attempt, the trade for Martin Erat seems no more than a desperate attempt for a playoff-bubble team to add some offensive scoring depth. Unfortunately, it may have come at a very heavy cost. 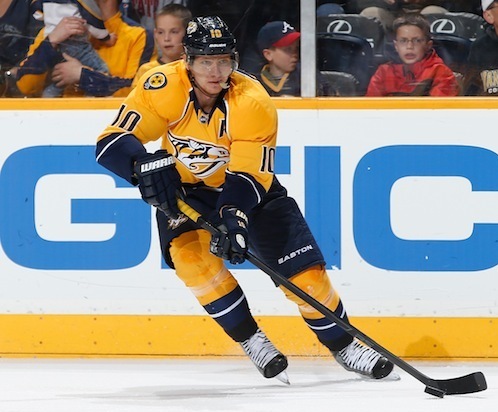 Erat currently has 2 years remaining on his contract with a cap hit of $4.5 million a year. The Capitals now currently have roughly about $6.1 million in cap space. Combined with the knowledge that the salary cap will drop roughly $6 million next season, and that Mike Ribeiro has openly stated that he wants a multi-year contract worth between $5-6 million per year means that the Caps may have a small financial crisis on their hands at the end of the season due to this trade. The main issue at hand has to do with whether or not the risk of acquiring an overpaid and aging forward for a potential playoff push is worth sacrificing a key component of an up-and-coming youth movement. Three months from now, one would hope that a deep playoff run might silence the critics of this trade. However, unless there is a parade on F Street within the next couple of years, this song may have quite a different tune. Fans in Washington have consistently grown angrier and louder over the last few seasons, wondering if this Capitals team’s window is closing. This trade signifies nothing more than perhaps the last “hoorah” for the longest tenured General Manager in professional sports. The question remains, however, what kind of team will he leave his successor, and how loud will Caps fans be then?